This blu-ray is for sale for $5 everywhere! Get it! Does the “Giant Monsters from Japan” genre fall into the action genre? From my research, Godzilla and friends seem to be of greater interest to a sub-suction of science fiction fans who can’t get enough of their favourite monster’s showcasing their powers and unique designs more than the how good the films are when the monsters are battling. I have seen a number of Godzilla films that came out in the 2000s, but have never watched the Gamera series until recently. The original 1960s Gamera series make some of the sillier Godzilla films look like Annie Hall. It does not help that the Mystery Science Theater 3000 crew has permanently etched in the minds of audiences that Gamera films are juvenile junk. Surprisingly, their jibs and jabs have become a blessing in disguise. Godzilla expert David Kalat has stated that special effects artist Shinji Higuchi was watching MST3K in a Los Angeles hotel room when he saw the mocking robots tear apart the Gamera films. Both Higuchi and director Shusuke Kaneko were on the cusp of rebooting the Gamera series in the 1990s, and did not want their creation to be viewed in the same light. The first two films in the 1990s Gamera series are mostly notable for their special effects. Gamera: Guardian of the Universe has very nicely detailed models but is hampered by poorly done compositing visuals that took me out of the film. The human characters are as stiff as ever in the first film, but they get a decent boost in Gamera 2: Attack of Legion, which has a story that feels inspired by/rips off Aliens and Them! As the third film re-uses and references the characters and plot points of the first two films, it is best to watch those if you want to get the most out of Gamera 3. That being said, Gamera 3: The Revenge of Iris is a great improvement from the first two films. Gone are the flatly lit sets, dull military planning scenes and half-asleep actors that only exit to talk about Gamera when he’s not on screen. The film also benefits from a darker tone and visuals that wouldn’t be out of place in a film like Dark City or Tim Burton’s Batman. The monster Gamera now looks far more threatening than before which suit the film’s plot written by director Shusuke Kaneko and screenwriter Kazunori Itō. 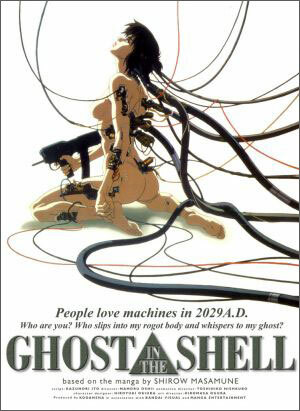 This was Kaneko’s first time as a screenwriter in a Gamera film, while Itō’s resume includes the acclaimed Ghost in the Shell and the Patalabor anime series. Put your mouse over the poster to see what could have been. Gamera 3 isn’t as serious as Ghost in the Shell, but as of its release in 1999, it was probably one of the most entertaining monster mashes of the decade! The characters are not leveled with complexity, but they are far more memorable than any previous entries in the series. Characters like Ai Maeda who has a delightfully bizarre bond with the monster Isis adds a human element to both the story and the monster which is desperately needed in this genre. Thankfully, secondary characters like a scenery chewing mad video game programmer are also amusing in their own right. Not all is perfect in Gamera 3, the film’s pace slows down a bit towards the middle where it becomes overtly talky. The anime influenced storyline is…daffy to say the least. Take the part of the plot that involves Gamera needing mana to survive…or something! These nature-preservation themed things are handled in much less derpy manner in films like Princess Mononoke. Some reviewers have complained about the computer generated imagery of Isis as straying too far from traditional kaiju territory. I’m not 100% for CGI in films, but I feel that Gamera 3 is a very strong combination of practical and computer generated effects. Besides, there are far more dated effects in Guardian of the Universe. If CGI was needed to create Isis, than I’m all for it as the creature is one of the more interesting beasts in the series. He/She/It follows my rules for a good monster in film. 1)	Don’t tease the audience about the look of a monster. People entering the film know it’s a monster movie and have seen trailers and posters so we all know how the monster looks! Give us something and make the monster evolve and change so it’s not some giant reveal for the last 15 minutes of the film. Gamera’s first reign of destruction happens fairly early in the film and is then followed by the development of Iris. 2)	Keep the monster motives interesting. After it attacks once, let part of the plot be finding out why it attacks and what kind of unique strengths and weaknesses it has. It’s more interesting to see what it can or cannot do and how people in the film deal with their monster problem. This works well in films like Tremors with the rock hopping to avoid the creatures or The Descent where the crawlers can only hunt their prey through sound. In Gamera 3,the characters who trust Gamera as a savior begin to have doubts while Isis’ connection with Ai Maeda keeps their status above par. The film was released on Blu-ray a few years back and is very easy to find at a price of under $10. So why is Gamera 3 never talked about? According to the website Tohokingdom.com, the film was not as financially successful as the previous Gamera films. The film ends in a cliff-hanger and no direct sequel. The next Gamera film was released in 2006 and was not part of this 1990s series, not made by Toho, and was a more family-friendly affair with a cute baby Gamera. I think Western audiences were more interested in the wave of J-Horror films like The Ring and The Grudge which were the newest hip films from Asia at the time. Not to mention that Battle Royale and the controversial films Takashii Miike were also a hot commodity of their day. It’s too bad, because Gamera 3 deserves as large of a fanbase as these films have. Perhaps it was because Gamera as a monster is harder to market. 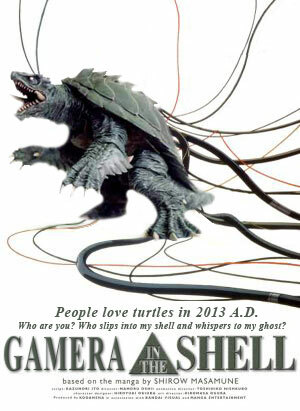 Gamera’s has to to appeal to a fanbase by sticking to it’s roots: he better still spin in his shell and fly around! Outsiders will definitely have a tricky time with the concept as, surprise, surprise: Turtles do not fly. Godzilla at least resembles more familiar lizards and audiences can associate him with a fire breathing dragon or a gargantuan dinosaur. It’s not easy being a turtle, let alone a flying one. Despite some minor flaws, Gamera 3 is heads and tails above other giant monster films in terms of story, action and spectacle. 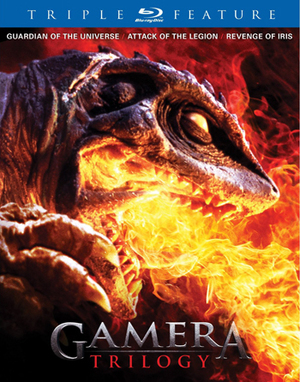 I have no hesitation in recommend picking it up the Gamera trilogy, so you can watch the other two films first to prepare yourself for the monster-bashing feast that is Gamera 3. Put your mouse over Gamera! Go Go Gamera! Happy Halloween! This entry was posted on Friday, November 1st, 2013 at 2:02 am and is filed under 1990s, gamera, Shusuke Kaneko. You can follow any responses to this entry through the RSS 2.0 feed. You can leave a response, or trackback from your own site.